Barcelona Photoblog: Pumpkins or Chestnuts? Halloween or Castanyada? Pumpkins or Chestnuts? Halloween or Castanyada? Although Halloween celebrations permeate Catalan reality each year and it is not strange to see carved pumpkins and people wearing fearsome costumes here and there, the eve of All Hallows' Day or All Saints is definitely about chestnuts, baked sweet potatoes with Moscatell (Muscat wine) and panellets in what is known as the Castanyada (Chesnut day). In general terms it is a supper, a very heavy one, considering the ingredients mentioned and that they are an extra on top of whatever you chose to have for supper that day. It is more probable that you see little girls dressing as castanyeras (ladies selling chestnuts), wearing peasant's clothing and a headscarf than kids knocking on doors playing Trick or Treat. 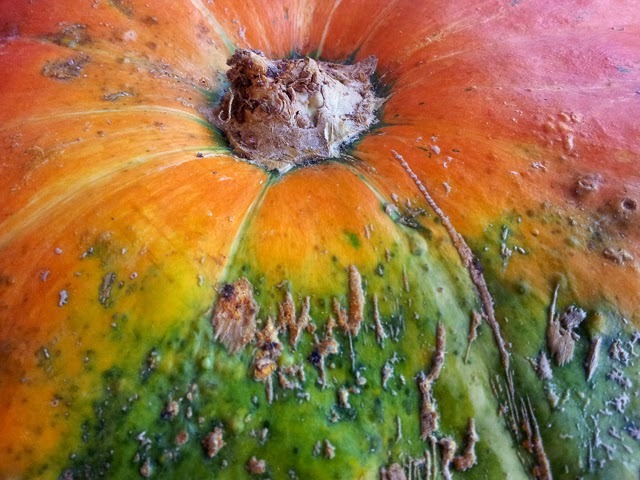 I leave you with this detail of a pumpkin that helped me bring the topic up.